In the northeastern part of Scotland lie the four counties of Aberdeen, Banff, Kincardine, and Angus. The county of Angus was early noted for its production of potatoes, grain crops, and feed. This shire contains a fine expanse of highly cultivated land known as Strathmore, which is one of the very fine valleys in that part of Scotland and which has become famous in the history of the Aberdeen-Angus breed. 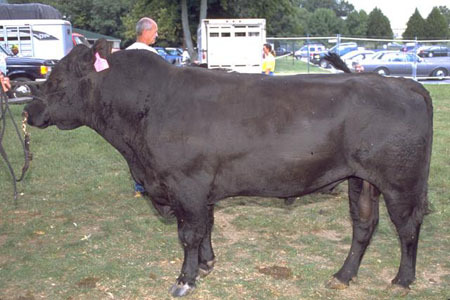 Two strains were used in the formation of what later became known as the Aberdeen-Angus breed of cattle. In the county of Angus, cattle had existed for some time that were known as Angus doddies. Apparently little attention was given to the breeding of cattle before the middle of the 18th century, but in the last half of that century, great progress was made in Scottish agriculture. It is not strange that, as farming practices were improved, men likewise sought to improve the livestock on their farms. It was only natural that breeders, in improving their cattle, would but cattle of similar kinds from adjacent areas, and as a result, the cattle of the Angus doddie strain and the Buchan humlie strain were crossed. Crossing and recrossing these strains of cattle eventually led to a distinct breed that was not far different from either type, since the two strains were originally of rather similar type and color pattern. If any one person can be singled out as the founder of a breed of livestock, Hugh Watson of Keillor, who lived in the vale of Strathmore in Angus, is worthy of that distinction. If not the first real improver of Aberdeen-Angus cattle, he was certainly the most systematic and successful. Both his father and grandfather had been buyers and breeders of the Angus doddies. The family is known to have owned cattle as early as 1735. Hugh Watson was born in 1789 and, in 1808, at the time he was 19 years of age, he became a tenant at Keillor. The first great herds of Angus beef cattle in America were built up by purchasing stock directly from Scotland. Twelve hundred cattle alone were imported, mostly to the Midwest, in a period of explosive growth between 1878 and 1883. Over the next quarter of a century these early owners, in turn, helped start other herds by breeding, showing, and selling their registered stock.